This voyage was the first leg of the ship’s 2017 World Cruise, a nine-night transatlantic crossing from Southampton, England to New York City. 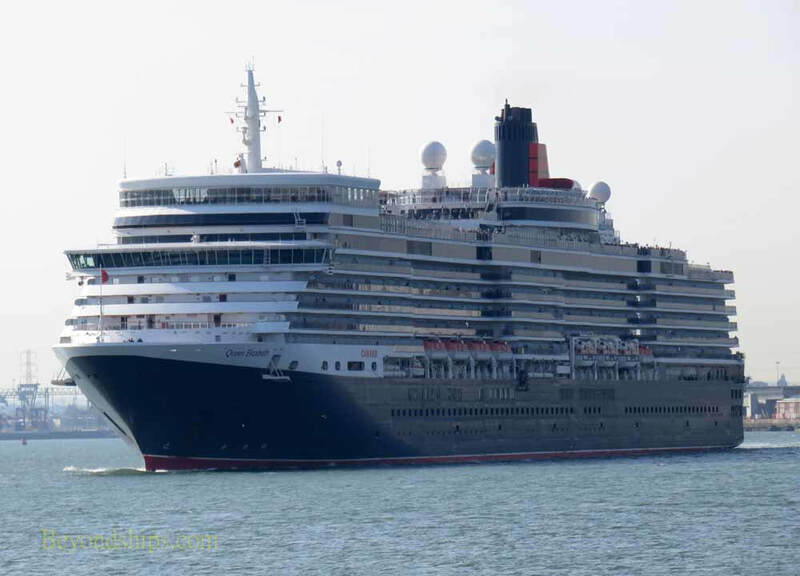 The Queen Elizabeth, which entered service in 2010, is now considered a mid-sized ship. It is 965 feet long and has a gross tonnage of 90,901. By contrast, the Queen Mary 2 is 1,131 feet long and has a gross tonnage in excess of 150,000. Since we had enjoyed our previous sailings on the Queen Elizabeth, including its maiden transatlantic crossing in 2010, we decided to book the crossing and make arrangements for a short pre-cruise stay in London. We arrived at Southampton at about 11:20 AM and took a taxi to the Ocean Terminal, where the Queen Elizabeth was docked. We quickly handed our suitcases to a porter and then proceeded into the terminal. The embarkation line was very short and we were soon on our way to the security screening area for a scan of our carry-on bags. We were able to board the ship after only a short delay. Once on board, we went straight to our balcony cabin located aft on the port side of Deck 6 and stowed our carry-ons and coats. We then went to the Lido Restaurant on Deck 9. By 12:30 PM we were enjoying our lunch and our table by the window with its great view of the piers for the Isle of Wight ferries and the port of Southampton. After lunch, we explored the ship and admired its Art Deco décor. The three-deck lobby in the center of the ship has a beautiful marquetry panel portraying the bow of the Queen Elizabeth. This panel was provided by David Armstrong-Jones, the 2nd Earl of Snowden, often referred to as Viscount Linley. The library on Deck 2, just off the lobby, has a spiral staircase up to Deck 3. A large selection of fiction and non-fiction books can be borrowed. Travel-related reference books can be perused in the library. A librarian is on duty to help with any inquiries. Each day in the library, a crossword puzzle and a Sudoku puzzle are provided at the entrance on Deck 2. As you head forward on Deck 2 from the lobby on the starboard side, you enter the Queen’s Room, a two-deck lounge with a large dance floor. This is the venue for dance classes, afternoon tea and ballroom dancing at night. As you proceed toward the bow on Deck 2, you find the balcony of the Royal Court Theatre. This room, with its tiered seating and side balconies, resembles a West End theatre in London. During the day, you can attend lectures and, in the evening, enjoy comedians, classical music concerts and production shows with singers and dancers. On our voyage, we enjoyed five lectures by William Miller, aptly dubbed “Mr. Ocean Liner”, who regaled large audiences with tales of liners and cruise ships of yesteryear and today. We also enjoyed lectures by Brian Hoey on the British royal family. Since there was a former footman to Queen Elizabeth on board the ship, Brian would occasionally ask him for confirmation of certain facts. Dinner aboard the Queen Elizabeth is served in five separate venues, the Queen’s Grill, the Princess Grill, the Britannia Restaurant, the Verandah Restaurant and the aforementioned Lido Restaurant. The passengers in Queen’s Grill suites dine in the Queen’s Grill on the port side of Deck 11 in the middle of the ship. Directly opposite the Queen’s Grill is the Princess Grill for the passengers occupying Princess Grill suites. * David G. Hume is past chairman of the World Ship Society PONY Branch, Mr. Hume has been on 75 cruises and crossings as well as numerous ship visits." The majority of passengers dine in the largest dining room, the Britannia Restaurant on Decks 2 and 3 at the stern. Since the Queen Elizabeth can accommodate over 2,000 passengers, it is necessary to schedule two sittings for dinner, one at 6:30 PM and one at 8:30 PM. For this voyage, we were assigned to a table on the lower level of the Britannia Restaurant for the late sitting. ​On one evening, our entrée options included, among other things, broiled lobster tail, duck a l’Orange and Beef Wellington. The food was always tasty and the service was very professional. ​The Verandah Restaurant is specialty restaurant located on the port side of Deck 2 off the lobby. Lunch and dinner are served here for an additional charge. This space is decorated in Art Deco style similar to the Verandah Grill on the original Queen Mary of 1936. We dined in the Verandah Restaurant once for lunch with a friend who was on board. This restaurant offers many French specialties and the large windows provide a great view of waves rolling by the ship. The final dining venue is the Lido Restaurant, with cafeteria-style service for breakfast, lunch and dinner. In the evenings, a section of the Lido Restaurant was cordoned off as a specialty restaurant with waiter service. While we were on board, the space became the Smokehouse, offering American smokehouse cuisine, for four nights, La Piazza, offering Italian cuisine, for three nights and Coriander, offering Indian cuisine, for one night. During the crossing, there were three formal nights. Men wore tuxedos and suits and women wore gowns and cocktail dresses. On these formal nights, many of the passengers were invited to pre-dinner cocktail parties hosted by the officers of the ship. These parties provided a good opportunity to meet and chat with the officers. On Deck 10, the Commodore Club is an elegant room overlooking the bow of the ship. This room is a great venue for pre-dinner drinks. There is often a pianist playing popular tunes. Just aft of the Commodore Club is the Yacht Club. This venue opens at 11:00 PM and a DJ and a band alternate to provide lively music well past midnight. One of the best features of the Queen Elizabeth is the promenade deck, which completely encircles Deck 3. The forward end is enclosed and protected from the wind over the bow. This deck has many padded lounge chairs, great for sitting and watching the sea or fellow passengers walking and jogging. On the ninth day of our voyage, we docked at Pier 90 at 50th Street on the west side of Manhattan. This was one day before we were scheduled to disembark. The early arrival was designed to enable the passengers who were continuing on the World Cruise to sample the restaurants and night life of New York City. Several tours were offered, including a visit to the Cotton Club in Harlem. Those continuing on the World Cruise also had a full array of tours to choose from the following day. The weather on our crossing was often overcast and sometimes rainy, but it was not very cold because we took a more southerly course across the Atlantic. Also, the seas were very moderate, so there was very little pitching and almost no rolling. There was just enough movement of the ship on the waves to remind you that you were at sea. We enjoyed our crossing on the Queen Elizabeth and we were sorry to disembark.